Check out Chef Ashley Simone's appearance on WCIU's "You and Me This Morning" making these tasty vegan treats. Tomato and Zucchini Tartlets are perfect this time of year and especially for your Labor Day BBQ. There's still lots of great fresh tomatoes and zucchinis at farmer's markets, or maybe in your own garden. This recipes has several parts. It's a great appetizer and one that's fun to make. In fact, if you have kids, get them to help make these. Drain one can of garbanzo, reserving the liquid in another bowl. Using a food processor or a blender, blend garbanzo beans, olive oil, lemon juice, tahini, garlic, and some of the reserved liquid from the garbanzo beans (possibly ¼ cup). Put in blender. Stop regularly and push down the mixture in the sides. Add liquid as needed. Once it’s running smoothly, add in spices. Add salt and pepper as needed. Set aside. Slice both tomato and zucchini into rounds 1/8 inch thick. Put in a bowl and toss with olive oil, salt and pepper, and thyme. Grill the vegetables either on an outdoor grill or on a searing hot grill pan. Make sure that the grill/grill pan is clean and well oiled before putting on the vegetables. Grill the vegetables until you get dark grill marks on either side a minute or two. This is just to get the nice grill marks. Take off the grill and set aide to cool. Take out the puff pastry and allow to thaw. About an hour. Make sure you don’t leave out too long or it will be hard to work with. Flour your surface. Take out puff pastry and unfold it. Flour a rolling pin and smooth it out, evening it out. Use cookie cutters. Flour them and cut out rounds (shapes) and put onto a cookie sheet lined with parchment paper or silpats. If using parchment paper, use a little cooking spray. Place on sheet with room in between. Poke holes in the pastry with a fork (to ensure it doesn’t rise too much. This is called docking the dough.) Brush with olive oil. Take hummus and spread over rounds up to 1/8 inch from edge, medium layer maybe 1/8 inch deep (or more if you’d like). Then place one piece of the grilled tomato or zucchini on each of the rounds. Bake in oven for 18-20 minutes. Serve tartlets hot or room temperature with the chiffonade of fresh basil on top. And, you can watch a segment from WCIU and see how to make these. I went into ecstasy recently about an incredible corn eating experience. I have to admit, I didn't use the Mirai corn for this recipe, but this would be even more foodgasmic if you used that corn. Whatever corn you use, this recipe is going to knock your socks off. To prepare the corn, pull back the husks and remove all of the silk threads inside. Close them back up tightly and soak in a tub of water for at least 30 minutes. 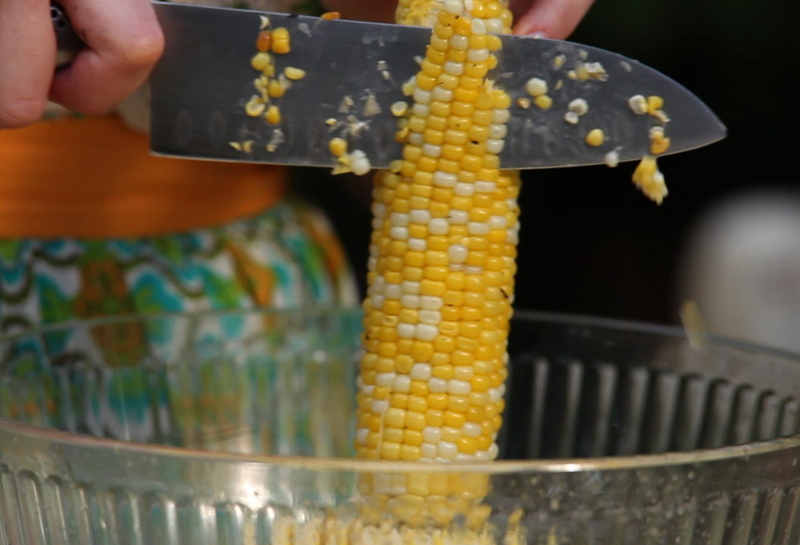 When you are ready to grill, wrap each ear of corn (with the husks on) in tin foil. This helps to keep the corn nice and moist. Put on medium high grill fro 20-30 minutes with the grill covered. Make sure to turn the corn a few times to ensure all side are done. You can tell if they are done by doing a taste test. Just wrap the corn and cut off a kernel and see if it’s sweet, tender and done. I like mine to still have a little crunch to them. While the corn is cooking, you can prepare the mayonnaise sauce. In a medium size bowl add in the Mayonnaise, garlic, lemon zest, onion powder, nutmeg, feta, oregano, salt and pepper. Mix till everything is incorporated. Set aside. Once the corn is done, cut the kernels off the cob while it is still hot and put into the bowl with the mayonnaise sauce and mix it all together. Be careful not to burn yourself and use a hot pad to hold the corn. Serve in martini glasses or other cute little glass bowls. 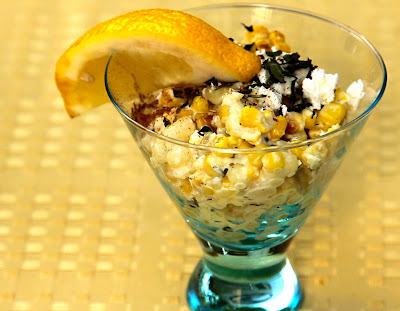 Portion the corn mixture into serving glasses and top with the extra feta and oregano. Sprinkle with the cinnamon and serve with a wedge of lemon. It is recommended to squish the lemon in before you eat it as it imparts an extra burst of lemony goodness. Watch the episode to see how I approached doing this recipe. Over the years that I’ve spent cooking I love to find neat little cooking tricks or simple things to make that seem way more complicated and impressive. I also have found that I love to share this with friends and loved ones. And now I want to share it with all the amazing Foodgasm followers. 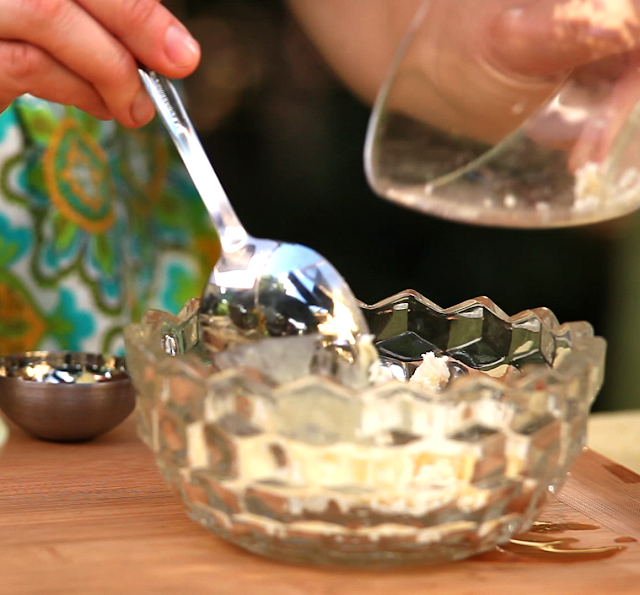 This one is just a simple recipe for homemade mayonnaise. It’s made very simply in a blender in about 5 minutes or less. The trick is being patient and pouring the oil in very slowly. In this recipe I use champagne vinegar, which can be found at most grocery stores. I love that it has a little tang and zip to it. Then this mayonnaise you can use by it’s self or add pesto to it to make a pesto mayonnaise for sandwiches or wraps. Also adding a sundried tomato paste or spread is a great idea too. These ideas for gourmet mayonnaise are perfect for a BLT (or Fake Bacon BLT if you are vegetarian). It’s also great for any mayonnaise-based salads. You will definitely notice the difference in taste, much better and very Foodgasmic. This mayonnaise will keep about 3-4 days in the refrigerator, so it’s best to use right away. Hope you enjoy the Zesty Blender Mayonnaise. Let me you’re your favorite way to use and then eat this sassy mayonnaise. Enjoy! ¼ teaspoon kosher salt, or to taste. Place the egg yolks in the bowl of the food processor and add the vinegar and mustard. Add salt. Turn the machine on and VERY slowly start to drizzle in the oil. Drip, drip, drip until the mixture starts to look like mayonnaise, THEN a slow steady stream of oil can be added. Adjust seasoning level if needed. SPECIAL NOTE: If the mayonnaise is too thick you can add a few drops of water or if it is not thick enough, you can with the machine running, add a little more oil. How about taking things a little bit further? That's what I challenged myself with when I recently appeared at the Annoyance Theatre's 25th Anniversary Celebration. They asked me to bring food and I settled on my Triple Threat Brownies. But I wanted to add even more flavor and goodness. That's what makes for a sure foodgasm--the extra that takes things over the top. Buttercream frosting? Easy. But why not make a buttercream frosting they won't stop talking about! So here's my caramel buttercream frosting. This is great, by the way, on top of my Triple Threat brownies--you can find the recipe in an earlier blogpost. 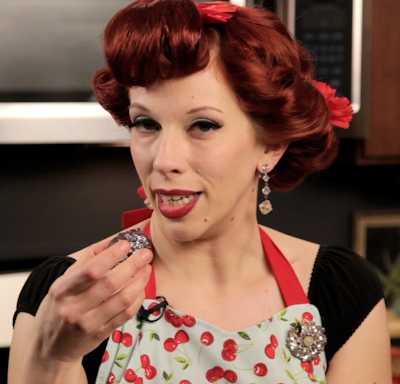 Or check out the episode again, where I show how to make these addictive sweets. Make sure the caramel sauce has cooled completely. In a mixer, beat the butter using the flat beater of your mixer. Add in the caramel sauce and beat till it’s combined. Start adding in the sugar, a few cups at first, then in smaller amounts, until the frosting reaches the consistency you like. Now it is ready to use to frost cakes or on top of my Triple Threat Brownies. Makes a little over 1 cup of sauce. Put the sugar into a heavy-bottomed medium saucepan and put in enough water to just cover the sugar and it looks like wet sand. Before starting, take a wet paper towel and wipe the insides of the pot down to the water/sugar mixture. This is to ensure no sugar burns on the sides. Heat the sugar and water on moderately high heat. Don’t stir at all, you can lightly swirl the mixture in the pan. Be very careful at the heated cooked sugar reaches very high temperatures and can burn easily. Let the water boil off until the sugar starts to bubble and the mixture gets thicker and starts to turn color. As soon as all of the sugar crystals have melted (the liquid sugar should be dark amber in color), immediately add the butter to the pan. Whisk until the butter has melted. Once the butter has melted, take the pan off the heat. Then slowly add the cream to the pan and continue to whisk to incorporate. Note that when you add the butter and the cream, the mixture will foam up considerably. Whisk until caramel sauce is smooth. Let cool in the pan. 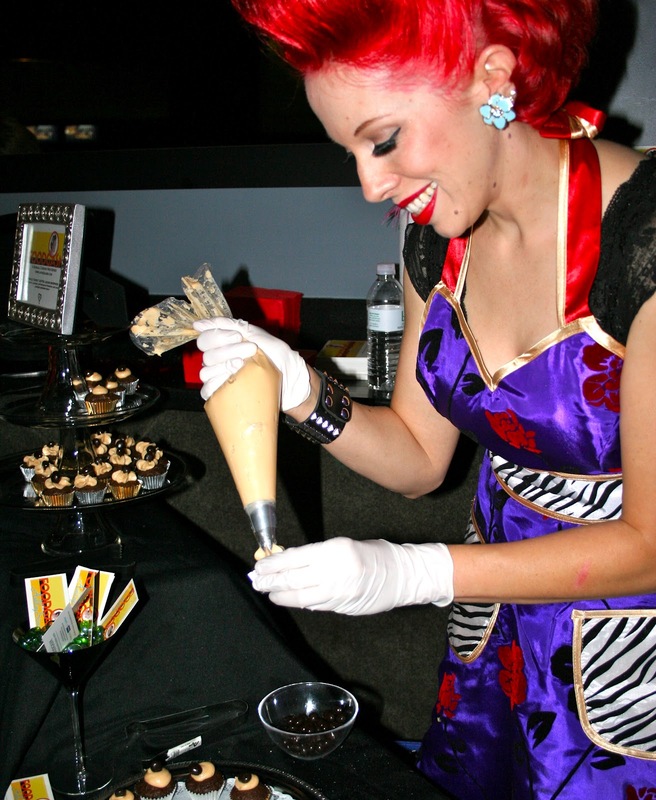 FOODGASM’s saucy chef Ashley Simone will appear at Annoyance Theatre’s 25th Anniversary Celebration this Saturday, August 18, at the Park West, 322 W. Armitage, in Chicago, at 7 pm. Besides looking totally scrumptious, she’ll be passing out some of her devilish Triple Threat Brownies. Need something to do Saturday night? There will be performances and music and great food. A cash bar. It’s a party not to miss. Tickets are still on sale. If you're lucky, you'll get one of those Triple Threat Brownies! The other day on a long bike ride, I happened to stop by a local farmer’s market. One farmer was giving out little samples of his corn. It was uncooked and on the cob. I ate it just like that and it was so sweet and juicy that I bought some on the spot. Packed them up on my bike and headed back home to throw them on the grill for lunch. After removing the silk inside and keeping the husk still on, I soaked them for about an hour in water. I grilled them for about 20 minutes in their husks. The turned out to be the BEST corn I have ever had in my entire life! I served them simply with a fresh herb compound butter, salt and pepper. This corn was so sweet, plump and juicy. The flavor and texture was perfect in every way. The combination of the amazing corn, creamy butter, and fresh herbs was a perfect Foodgasmic experience. I was curious to know more about the farm this super delicious corn came from. It's called Twin Garden Farms and is located in Harvard, IL. They have developed a brand of corn called Mirai®. According to them, it's "the most flavorsome corn in the world." I'm inclined to agree with them. Any chance you get, go support your local farmer’s market. There is nothing better than fresh and local produce! Farmer’s markets are a perfect place to find vegetables and fruit that are Foodgasm worthy. And here's what I put on my grilled corn.